Pterygium is the name given to a degenerative/’wear and tear’ change of the surface of the eye, which results in growth of conjunctival tissue (from the white of the eye) across the cornea (the clear window through which you see). The pterygium is red, fleshy, and thickened in comparison with the normal conjunctiva. Pterygium is NOT a tumour or cancer. It is a growth of normal tissues into the wrong place. 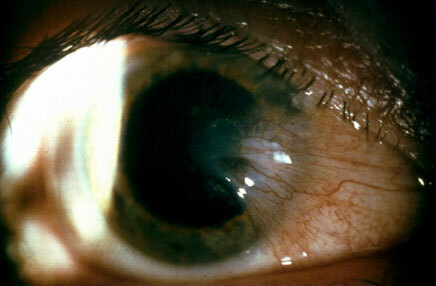 Many factors contribrute to the formation of pterygium. In many cases no single cause is found. The most important risk factor is thought to be exposure to sunlight (ultraviolet light), particularly before the age of 12 years. Injuries and inflammation of the eye can also cause pterygium, and there may be genetic factors. Appearance : Both the red, thickened body of the pteryium, and the extension across the cornea (head) may be unsightly. Discomfort and dryness : Pterygia are raised above the level of the rest of the surface of the eye, and are prone to drying. This causes symptoms of dryness, foreign body sensation and sometimes soreness. Vision : Large pterygia which have grown over or near to the pupil, can obstruct vision and/or reduce the focusing of the eye, such that sight becomes reduced. Will my pterygium get worse? Many pterygia grow 1-2mm onto the cornea and then stop. A minority continue to grow across the eye. If the pterygium is small and not causing symptoms then no treatment is needed. Symptoms of dry eye and discomfort are often eased by artificial tears. If the pterygium is unsightly, uncomfortable, or affects vision, it may be necessary to proceed to surgery. The pterygium is carefully cut away from the eye. If a bare patch were left there would be a high likelihood of recurrence. To avoid this a ‘conjunctival autograft’ is used to fill the defect on the white of the eye created by removing the pterygium. Tissue is taken from under the upper lid and sewn into place over the defect using very fine dissolving sutures. The operation can be performed under local anaesthetic, with the eye frozen or numbed by eyedrops, or under general anaesthetic, with the patient asleep. For the first one or two days after the operation the eye is painful. This then becomes a scatchy, itchy, foreign body sensation for 1 to 2 weeks. The eye will be red and swollen over the surgical area for several weeks, settling over about 3 months. Antibiotic cream is prescribed for 2 weeks to prevent infection, and steroid drops are used for up to 3 months to help reduce inflammation. As with any operation, there is a small risk of infection or bleeding. 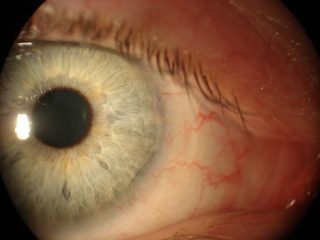 The pterygium may come back (within a year) in up to 50% of cases without an autograft and 5-10% with an autograft. If it does come back it may be more aggressive and progressive than before surgery. Surgery can be repeated, but with lower success rates. With a large pterygium, and especially with ‘redo’ surgery, there is a risk of damage to the surface or the muscles of the eye. In the worst case, further reparative surgery might be needed, and it may not be possible to restore a normal eye. Permanent loss of vision, or double vision can result. In most cases a pterygium comes away very cleanly and heals well, leaving only faint scarring on the cornea and with the white of the eye slowly returning to a normal appearance. In cases where the pterygium has affected vision by inducing astigmatism, restoration of a more normal surface reduces astigmatism and improves vision. 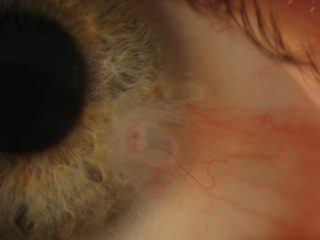 These images show the distortion of the corneal shape induced by a pterygium, seen as disruption of the rings on lower left photograph, and increased irregular astigmatism (top left). 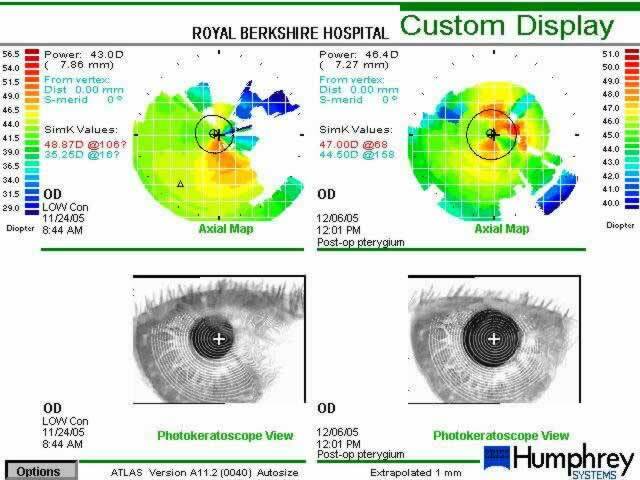 The right hand side shows that post-operatively the rings are less distorted and astigmatism is reduced.